Tidal circulation is one of the key drivers for the health of the Lagoon. Incoming tides replenish dissolved oxygen, salinity, and temperature levels within Lagoon channels, which are required for aquatic organism health. Outgoing tides flush out impounded waters that are often depleted of dissolved oxygen, as a result of respiration and other factors that include legacy pollutants such as nitrate and phosphate in Lagoon soils. Tidal circulation within a coastal lagoon or estuary is often quantified as tidal prism, which is the volume of oceanic water that resides within a coastal lagoon or estuary between mean high tide and mean low tide. Tidal prism plays a key role in keeping inlets open and, if large enough, can produce sufficient inlet channel flow during tidal cycles to prevent deposition of sand that causes inlet closures or occlusion. Prior to the construction of the railways across the Lagoon, the inlet at Los Peñasquitos Lagoon likely remained opened most of the year with occasional but infrequent closures. It is estimated that by 1925 the tidal prism of the Lagoon had been reduced by 50–75% because of construction projects such as the two railway alignments and Highway 101 and, as a result, the Lagoon’s tidal prism was no longer large enough to keep the inlet open (Hubbs and Whittaker 1972, Mudie et al. 1974). The first recorded inlet closure at Los Peñasquitos Lagoon occurred shortly after the construction of the 1888 railway alignment. The railway cut off storm flows from Carmel Creek from reaching the mouth, and this reduction of flow likely contributed to inlet closures. Sediment cores taken within Los Peñasquitos Lagoon also indicate a shift toward finer-grained sediments from 1910 to 1925 (Cole and Wahl 2000). Since fine-grained sediments are normally flushed out to the ocean by storm flows, the increase in silts and clays on the marsh plain indicate the likelihood of more frequent and prolonged inlet closures, which prevent the export of this material. Decreased tidal prism and extended inlet closures at Los Peñasquitos Lagoon can impact both aquatic and terrestrial habitats, impact native and migratory species, pose risks to nearshore coastal water quality, impair the Lagoon’s Beneficial Uses, and threaten nearby urban infrastructure vulnerable to flooding. Water quality parameters (e.g. dissolved oxygen and salinity) degrade during extended inlet closures once they are no longer exposed to tidal mixing from ocean waters. Impacts to water quality can occur rapidly during periods of warm temperatures typical of summer months, resulting in fish kills and loss of invertebrate communities. Since 1995 all three of the Lagoon’s three main tributaries became perennial, providing a new type of impact to Lagoon environs during extended closures as impounded water becomes hyposaline. As a result, Los Peñasquitos Lagoon has experienced rapid habitat conversion as areas of historic salt marsh located in the eastern portion of the Lagoon have been displaced by brackish and freshwater habitats. In addition to loss of salt marsh habitats, year-round inputs of freshwater from the watershed have also raised serious public health risks due to vector-borne disease. Los Peñasquitos Lagoon is also a known location of mosquito breeding habitat for Culex tarsalis, the species known to transmit West Nile Virus (WNV) in southern California. Documented cases of WNV have occurred in both wild and sentinel avian populations, as well as within human populations located near Los Peñasquitos Lagoon. When the inlet at Los Peñasquitos Lagoon is open to adequate tidal circulation, the threat of WNV is minimized since optimal breeding areas for Culex tarsalis are confined to areas of ponded water near the Lagoon’s tributaries and eastern areas. However, during prolonged inlet closures the Lagoon floods with freshwater, making the entire system viable breeding habitat for Culex tarsalis and making local human populations highly vulnerable to contracting vector-borne WNV. Therefore, keeping adequate tidal circulation in Los Peñasquitos Lagoon is not just important for its critters and plants, it is also vital for protecting human health from vector-borne illness that includes WNV and other forms of brain encephalitis. 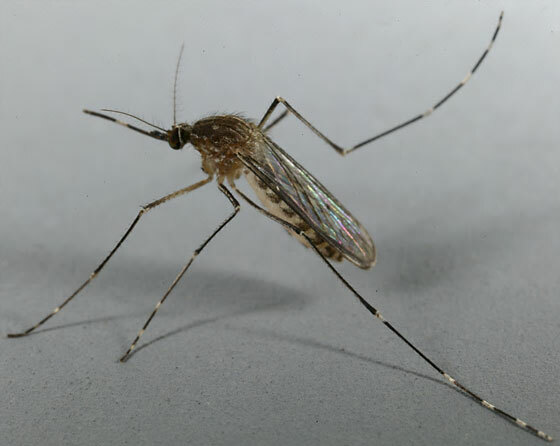 For more information about WNV and ways to avoid bites from Culex tarsalis and other mosquito species, please visit the County of San Diego’s website. Culex tarsalis, the freshwater mosquito species that can spread West Nile Virus to humans in San Diego County. Photo by unknown. 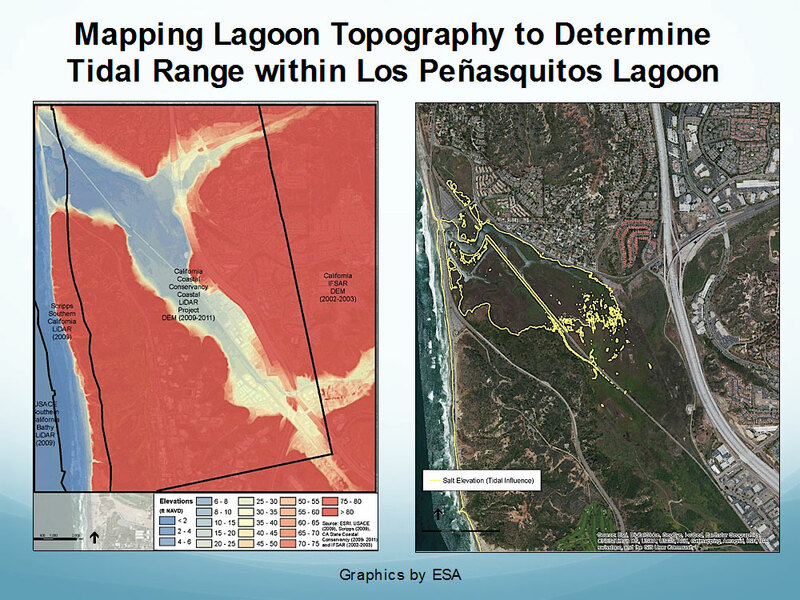 Elevations and the extent of tidal influence within Los Peñasquitos Lagoon. Graphics by ESA. Dissolved oxygen (DO) and water levels within LPL after inlet closure on 3/11/14. Note the rising water levels due to perennial dry weather inputs of freshwater from the Lagoon’s tributaries in conjunction with declining DO due to the lack of tidal mixing from ocean waters. DO levels below 5mg/l are considered stressful for aquatic organisms and DO below 1 mg/l toxic, resulting in fish kills and loss of invertebrate populations that are a primary food source for many of bird species that inhabit Los Peñasquitos Lagoon or visit it during the winter during migration along the Pacific Flyway.